So we have been working on PKNail for close to forever. Its intent is to capture existing conditions in Revit quicker, easier, better, faster etc. In theory, simple idea. In practice, much tougher. The product was born from my Architectural Services firm, Interioreview and from the need in creating a product/process that creates repeatable results. Have the knowledge in the software rather than with ‘Bob’. PKNail aids someone on the ground capture key data and tie out the model/dimensions on site rather than having to collect data and then sit in front of a computer off site hoping the whole thing goes together right. Using Interioreview as a skunk works to continue testing PKNail in the field to go against real world situations, fine tune features and in general try to break it so it will be rock solid when it hits the field. We have been persistent in our goal. I read somewhere recently that the first 90% takes 75% of the time, the last 10% takes the other 75%: It would not be unfair to put us squarely in the this math challenged adage. Until recently when using PKNail in the field we also used products/techniques side by side to capture the same information. This was so we can compare results and make certain we never get hung up. However, I am proud to say we started and completed a complex project using only PKNail in the field to capture the majority of structure, walls (exterior/interior partioning/etc.) windows, doors, etc. PKNail allows a user to communicate/drive Revit wirelessly through a bluetooth enabled range finder. That is, press a button to measure a wall, take measurement, press another button and the wall gets built in Revit, add a window, door same things, move room to room, floor to floor. Can it help you put in complex gutter or roof sweeps? No. Can it it help you knock out structure and jump start your project, you bet. The Deerfield Academy Arts Center is a series of interconnected building design/built over the past century. Incorporated into the strucutre is an Art Gallery, Theatre, Studios, Auditorium, Architecture Studio, etc. PKNail was used to capture the shell/exterior of the building and then used to move inside the structure to capture all the wall partioning, doors, etc. 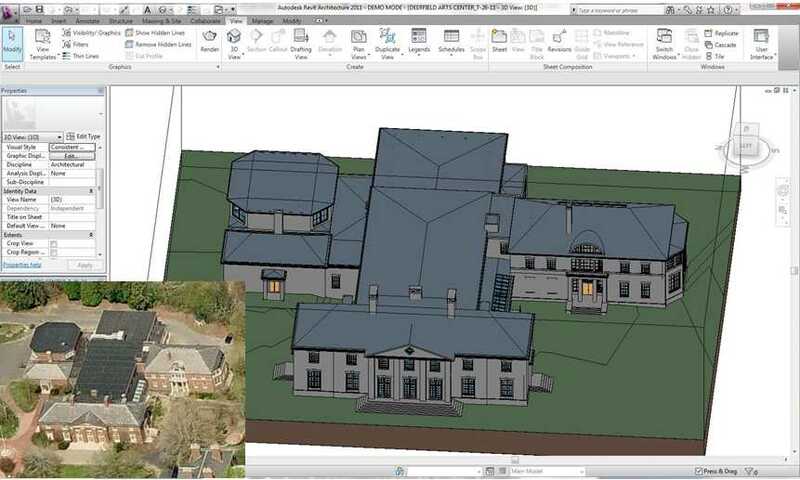 The exterior detail was modeled back in our office from field data, like stone work, exact window profiles and roofs.